Action Adventures ? 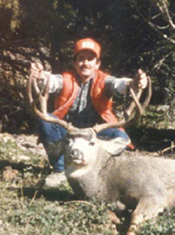 A premier Colorado Outfitter and Guide specializing in trophy mule deer and elk hunts in unit 66. Action Adventures is a top rated Colorado Outfitter and Guide offering trophy mule deer and elk hunts in the mountains and valleys of unit 66. Jay Mitchell has been operating this Outfitter and Guide service in the famed Gunnison Basin area of south central Colorado for over 20 years and in this time, he has built a success rate that is difficult to beat anywhere. Having the privilege of hunting the Gunnison Basin as a deer guide insures that many of his clients go home with a true trophy buck. Whether they are hunting the early season above timberline or later down in the more accessible foot hills, the area Action Adventures guides offers a real opportunity to take a giant trophy mule deer. They access the high country via horseback through some of the most inspiring country the Rocky Mountains has to offer. The lower country is effectively hunted with the used of 4x4?s and 4-wheelers to access the hunting areas and then hiking out from the road or trail. 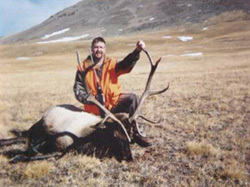 High quality and high success elk hunts are also offered by Action Adventures. Like their deer hunts, they have several types to choose from. They offer a high country pack in hunt where you will be pursuing trophy bulls that experience far less hunting pressure than those that reside in areas with easier access. If a more comfortable hunt is what you are looking for, they also offer a lower elevation hunt based out of comfortable cabins on thousands of acres of private land. You can even choose between a fully guided or semi-guided hunt. On the semi-guided hunts, you will have a ?camp host? that is experienced in the area and the game being hunted. They will prepare your meals and give you insight on where to hunt. This is a great option for those wanting to hunt on their own, but may not have the time to scout an area before the season begins. With this option, you can take advantage of the knowledge and experience of the Action Adventure staff, but still experience a do-it-yourself type hunt. Regardless of which type hunt you are looking for; be it an above timberline mule deer adventure, a black timber trophy bull elk hunt, or even a lowland late season deer or elk hunt, Action Adventures has the hunt to fit your hunting objectives. Check out their website at Action Adventures or contact HuntersTrailhead for more details.